Microsoft.Office.Web.Environment.Sharepoint.CacheCreationJob - Object reference not set to an instance of an object. The Execute method of job definition Microsoft.Office.Web.Environment.Sharepoint.CacheCreationJob (ID 8ea0b71c-08c4-4644-a0bc-c361c391bc45) threw an exception. More information is included below. The problem is the "Office Web Apps Cache Creation" SP Job tries to run every 5 minutes but fails for some reason. The Cleanup job also fails that is scheduled to run daily. Then, I mounted the Office Web Apps ISO, and started a repair. Rebooted the server and good to go! No more errors. UPDATE: Don't forget to run the SharePoint 2010 Products Configuration Wizard after the installation if your search doesn't work. Pretty uncomfortable. The day before this I deleted the AD Sync Connection from SharePoint's User Profile Service Application and this caused it. The sync job ran and with no connections SP thought that all the users have been deleted. Theoretically there should be 14 days until these profiles are deleted but for some reason I can't see past activity for the use users. Long story short, I need to restore MySites from a backup. The restoring process is simpler than thought. Later I found out that I had to restore the User Profile Service Application as well, I will detail that later. 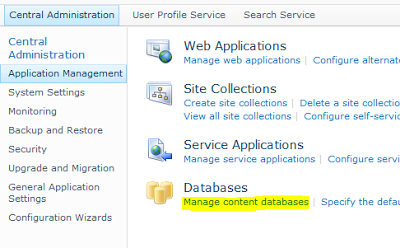 Unmount the MySites content database by going to Central Administration -> Application Management -> Manage Content Databases. 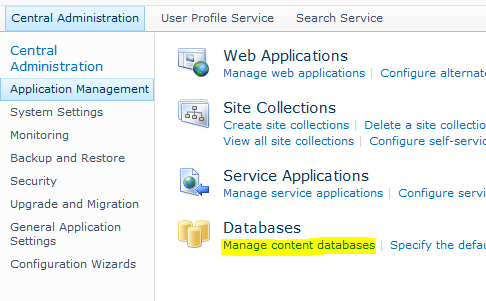 Central Administration -> Application Management -> Manage Content Databases. This data is stored in the User Profile Service Application's databases (Profile Database and/or Social Database, not sure). So these had to be restored as well. The process is fairly simple as long as you have the SQL backups. 3. Start the User Profile Service and User Profile Synchronization Service in Central Admin. After finally installing Centreon 2.4 on CentOS 6.3, all was up and running, one issue I had left. No email notifications were sent when a host was down although everything seemed to be correctly configured from the GUI (contacts, notification period, etc). Looking at /var/log/maillog gave no hints. But checking /usr/local/nagios/var/nagios.log was helpful. There is no command before the -s and the pipe. This results in email delivery failure. This can be fixed from the GUI. In Centreon go to Configuration -> Commands, select Notifications from the left. Two commands need to be edited: host-notify-by-email and service-notify-by-email. The string /bin/mail has to be inserted after the pipe. Then, export Nagios settings. Of course this fix implies that running /bin/mail from the command line results in successful email delivery. During Centreon installation when the tool starts up, the website is blank and nothing's happening. SELinux blocks httpd to write in any folder other than /var/www/ and some exceptions have to be made. semanage fcontext -a -t httpd_sys_rw_content_t "/usr/local/centreon(/.*)?" semanage fcontext -a -t httpd_sys_rw_content_t "/etc/centreon(/.*)?" semanage fcontext -a -t httpd_sys_rw_content_t "/usr/local/nagios/var/spool(/.*)?" semanage fcontext -a -t httpd_sys_content_t "/usr/local/nagios/share(/.*)?" semanage fcontext -a -t httpd_sys_content_t "/usr/share/php(/.*)?" semanage fcontext -a -t httpd_sys_content_t "/usr/share/pear(/.*)?" You may want to check out my blog post on Installing Centreon 2.4 on CentOS 6.3 x64. ## CentStorage: Log and charts archiving. ## CentCore: Distributed Monitoring engine. ## what you are doing. ## Where is your Centreon binaries directory ? ## Where is your Centreon data informations directory ? ## Where is your Centreon generation_files directory ? ## Where is your Centreon variable library directory ? ## Where is your CentPlugins Traps binary? ## What is the Centreon group ? ## What is the Centreon user ? ## What is the Monitoring engine user ? ## What is the Monitoring engine group ? ## What is the Monitoring engine log directory ? ## Where is your monitoring plugins (libexec) directory ? ## What is the Monitoring engine init.d script ? ## What is the Monitoring engine binary ? ## What is the Monitoring engine configuration directory ? ## Where is the configuration directory for broker module ? ## Where is the init script for broker module daemon ? ## Do you want to update Centreon Apache sub configuration file ? ## Do you want to reload your Apache ? ## Where is your Centreon Run Dir directory? ## Do you want me to install CentStorage init script ? ## Do you want me to install CentStorage run level ? ## Do you want me to install CentCore init script ? ## Some plugins require temporary datas to process output. ## These temp datas are store in the CENTPLUGINS_TMP path. Save the file and you're ready to install. When the installation is finished, open http://server/centreon/ in the browser. At the fifth page enter the details of the admin user. At the 6th page you have to specify the db details. By default the mysql root password is blank. After finishing the setup there'll be something wrong with the db so you'll have to go back to the shell to grant permissions for the centreon db user. mysql -e "grant all on centreon. * to 'centreon'@localhost identified by 'CentreonDBPassword';"
mysql -e "grant all on centreon_storage. * to 'centreon'@localhost identified by 'CentreonDBPassword'"
mysql -e "grant all on centreon_status. * to 'centreon'@localhost identified by 'CentreonDBPassword';"
Can't run make install at ../tools/build_perl_modules line 85.
make: *** No rule to make target `/usr/lib64/perl5/CORE/config.h', needed by `Makefile'. Stop. make: *** No rule to make target `/usr/lib64/perl5/CORE/config.h', needed by `Makefile'. Stop. Can't locate ExtUtils/MakeMaker.pm in @INC (@INC contains: /usr/local/lib64/perl5 /usr/local/share/perl5 /usr/lib64/perl5/vendor_perl /usr/share/perl5/vendor_perl /usr/lib64/perl5 /usr/share/perl5 .) at Makefile.PL line 11. BEGIN failed--compilation aborted at Makefile.PL line 11. Can't run perl Makefile.PL at ../tools/build_perl_modules line 68. The package ExtUtils-MakeMaker has to be installed first. Additionally, perl-devel is also needed to compile it. Then, reconfigure nagios-plugins. In this no-brainer guide I am going to detail how to install Centreon on a brand new CentOS 6.3 x64 machine. # Set your timezone in php.ini to get rid of an ugly warinng in the future.